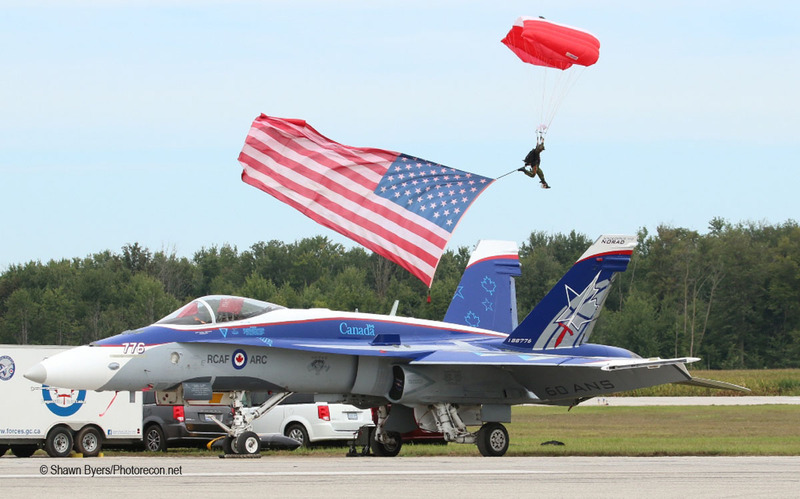 Despite being hosted at one of the busiest civil airports in the province of Ontario, and among the top 20 busiest by passenger volume in Canada, Airshow London 2018 featured a minimal amount of flying civil acts, with US and Canadian military stealing the show in a big way! 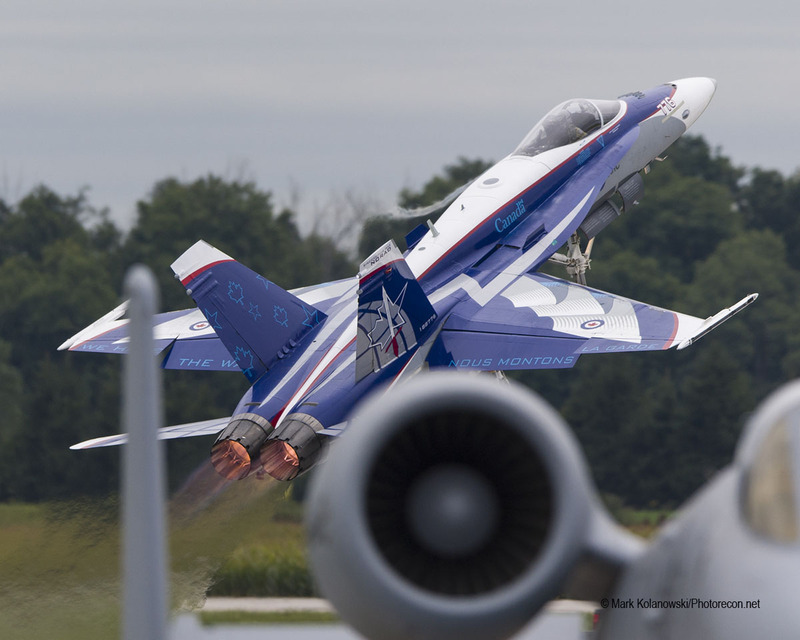 The show was filled with aviation photography highlights, and stiff breezes combined with unseasonably low temperatures that had all but the heartiest Canadians reaching for sweatshirts Saturday and Sunday. The show focused heavily on the partnership between the US and Canadian militaries, a fitting theme given that 2018 is the 60th anniversary of NORAD. 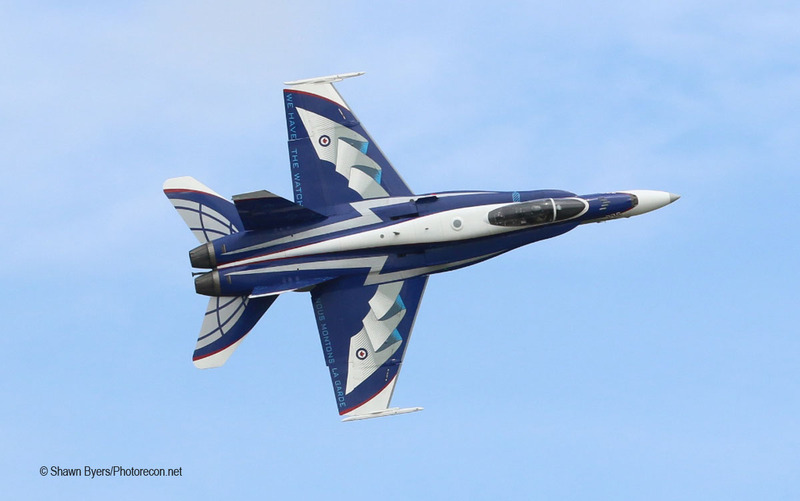 A tribute to the air defense partnership was emblazoned on the wings of this year’s CF-18 demo jet, continuing a tradition of beautiful paint jobs on Canada’s most famous Hornet each and every airshow season! 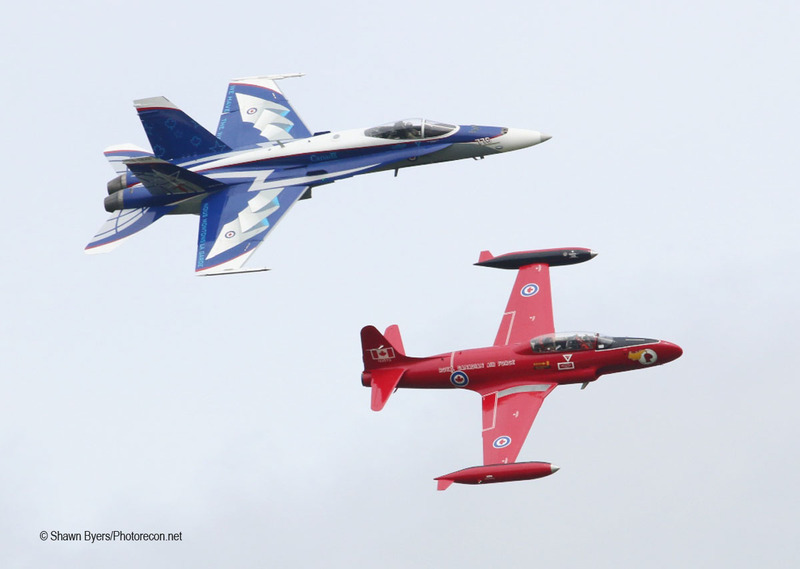 In addition to hometown aerobatic performers Pete McLeod and Mike Tryggvason, the show was headlined by the legendary Canadian Forces Snowbirds, with additional jet noise coming from the CF-18 Demo Team and the Viper Demo Team. 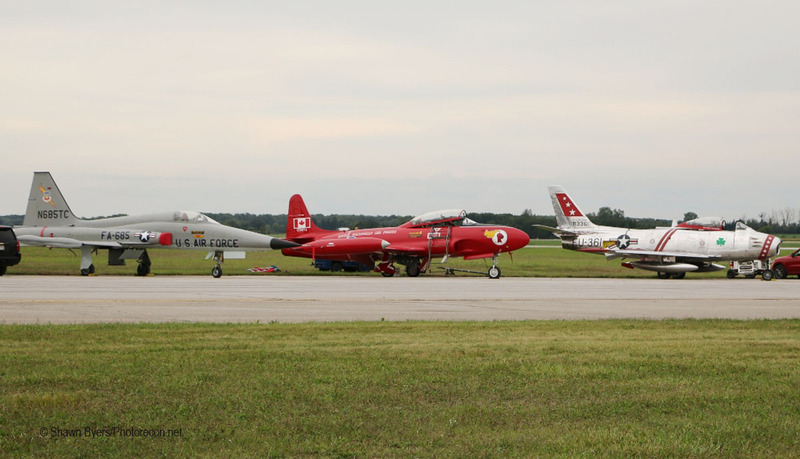 Also flying in the show were a mix of CF-18 and F/A-18E Hornets, A-10Cs, an F-22, C-130s from the US and Canada, an F-86, and a T-33 painted up as Canada’s Red Knight from the hometown Jet Aircraft Museum making its airshow debut! 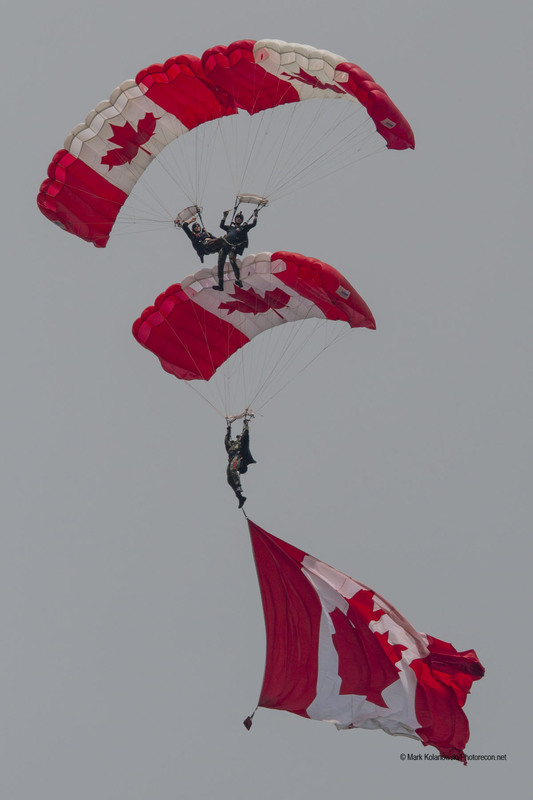 On top of all the aircraft, jumpers from the USSOCOM parachute team joined the Canadian Skyhawks under canopy in the skies over London International Airport. As CYXU is a facility with schedule passenger service it did not close for the show. Over half a million airline customers pass through the airport each year, and their timely arrivals and departures remain important despite the ramp full of show planes waiting to take to the skies. 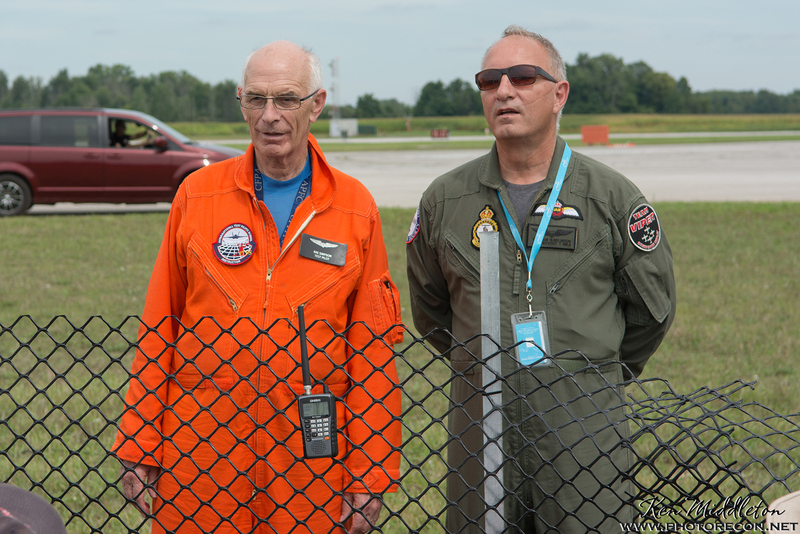 It was a treat to hear the air boss and control tower working together to deconflict the airspace as performers, air ambulance helicopters from ORNGE, airline traffic, and civil aircraft that happened to be in the area mixed it up in the skies over Southwestern Ontario. In a bit of a change from more traditional airshows stateside, London expands their performer lineup by sending up visiting aircraft to do normal training missions and entertain the crowd with some spirited pattern work upon their return. This year’s show featured this sort of “demo” by the Selfridge A-10s, a flight of Canadian and American Hornets, and even one of the F-22s from Tyndall! While low approaches don’t quite have the same impact and wow-factor to the crowd as a full demo, a series of low approaches, particularly with a nice background of trees, is a great way for photographers to experiment with panning and get the jetwash involved in the image in a way that’s often more difficult with normal demonstrations. Arrival and practice day Friday was a real treat for the assembled photographers. 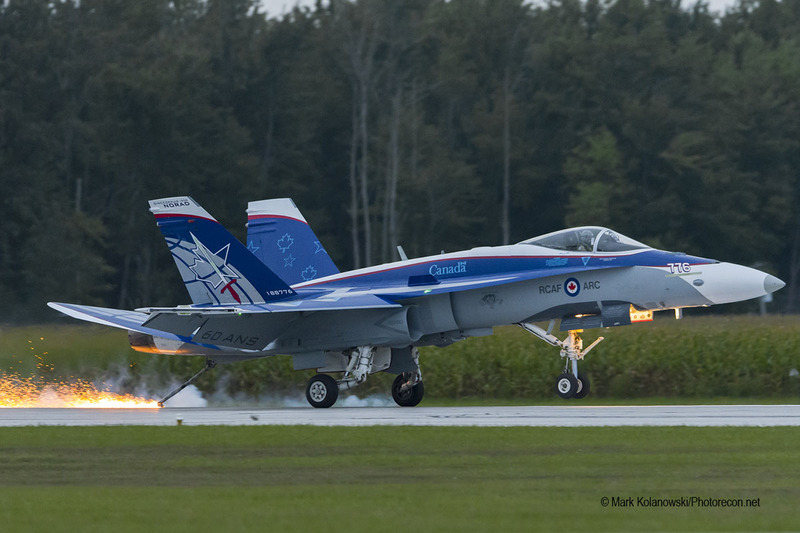 The first major move was a takeoff by a flight of four Hornets, a mix of CF-18s and an F/A-18E from VFA-143. The flight launched with burners lit for ACM training away from the field. Their return was the stuff aviation photography dreams were made of, with a series of low approaches that ended with aggressive overhead breaks at various points on the runway. On a show day with a waiver in effect it’s all but unheard of to have breaks directly over people, and being able to see things at such a close distance was a memorable experience. 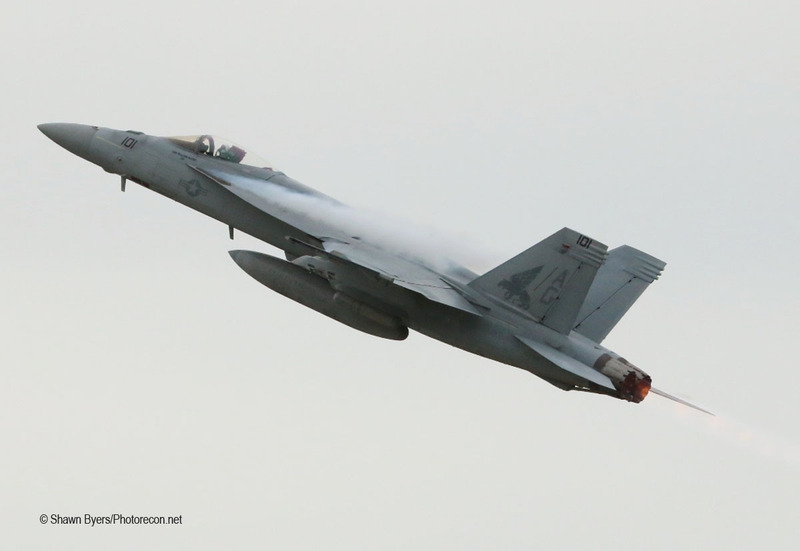 The Hornets were closely trailed by the F-35C from VFA-101 in one of the first airshow appearances of the Navy variant of the F-35. 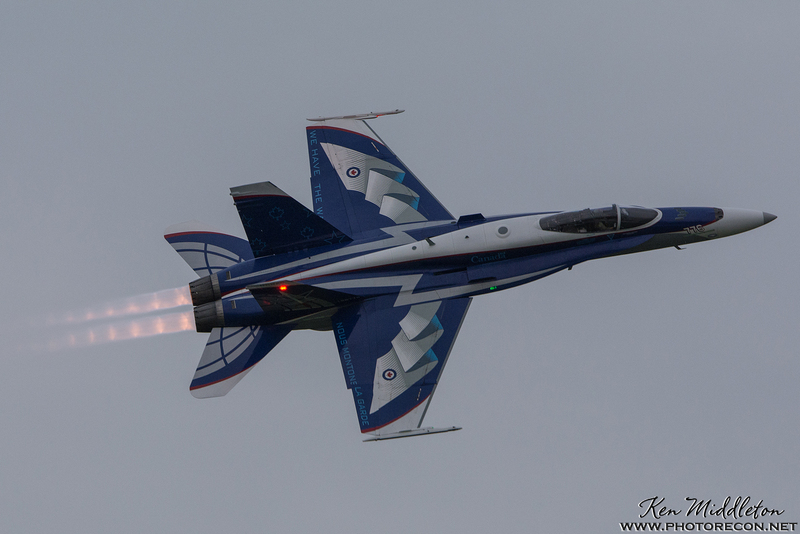 As Friday afternoon progressed, Rain took the F-16 up for a practice run, followed by Porcelain in the CF-18. Seeing demos from the two most prolific frontline western fighters back to back was an outstanding opportunity to compare the relative strengths and weaknesses of the jets. While Porcelain’s jet certainly won the beauty prize, sound of freedom award, and the angle-of-attack trophy, Rain made use of the Viper’s superior maneuverability to wow the crowd, and he was just warming up! 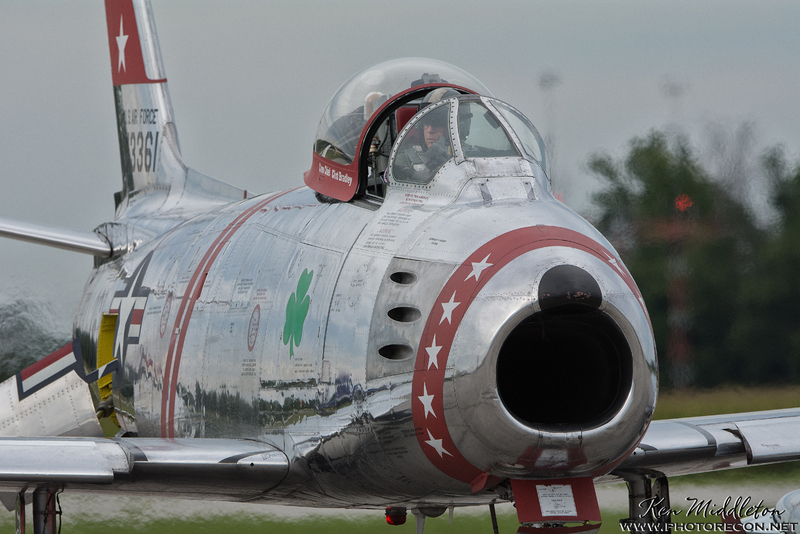 Jets of a different vintage followed the tactical demonstrations, first with Paul Keepler’s F-86. 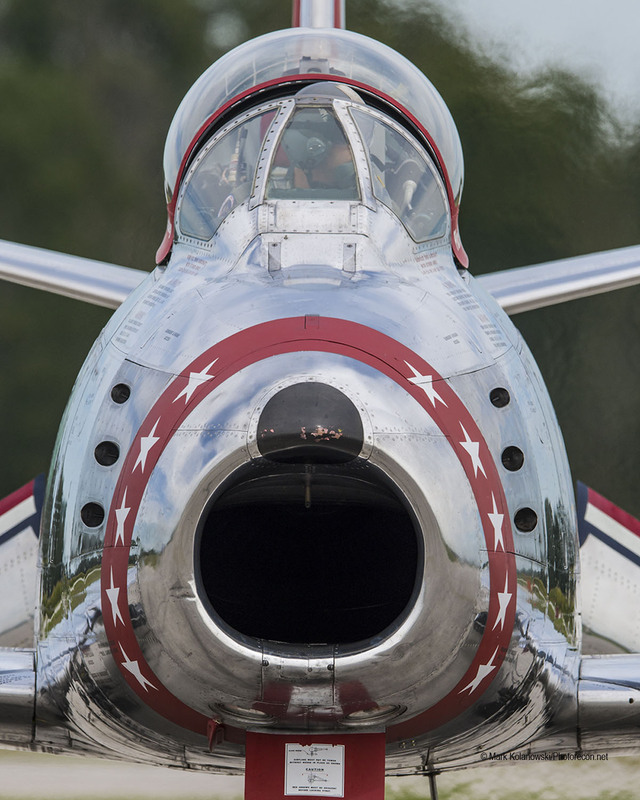 The beautifully restored and immaculately polished Sabre is a joy to see fly, as Paul puts it through a graceful series of figures that show off the dawn of the jet age. One interesting thing to look for during the demo is the deployment of the leading edge slats during certain maneuvers. The slats are held in place by aerodynamic forces for the majority of the flight, with certain high alpha maneuvers and slower speeds allowing them to pop out. As they’re deployed by aerodynamics as opposed to actuators, asymmetrical deployments are possible, as was the case at the top of one of the loops. What initially looked like a minor stall as the aircraft reached the apex of the maneuver actually was a brief period of a single slat deployment. 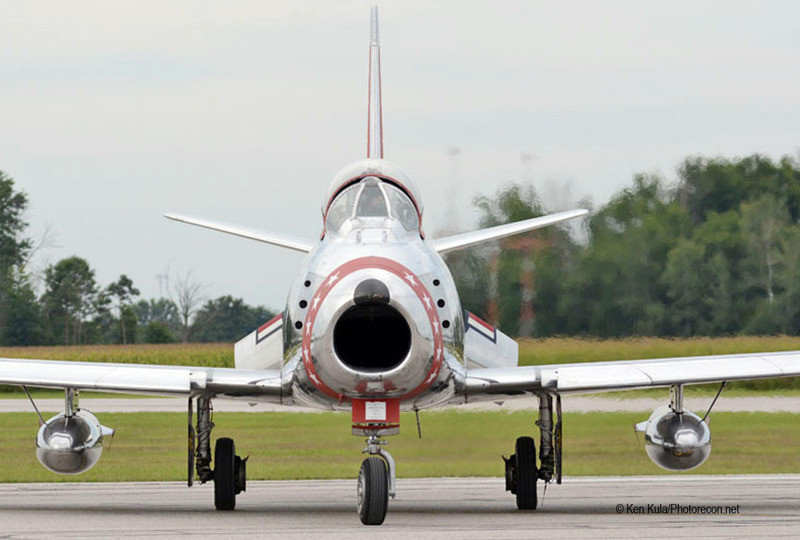 Paul’s Mig Alley Airshows teammate Jeff Kaney was in town with a rare F-5A, but rumor has it he grounded with an illness and the sleek jet remained on the ground all weekend. 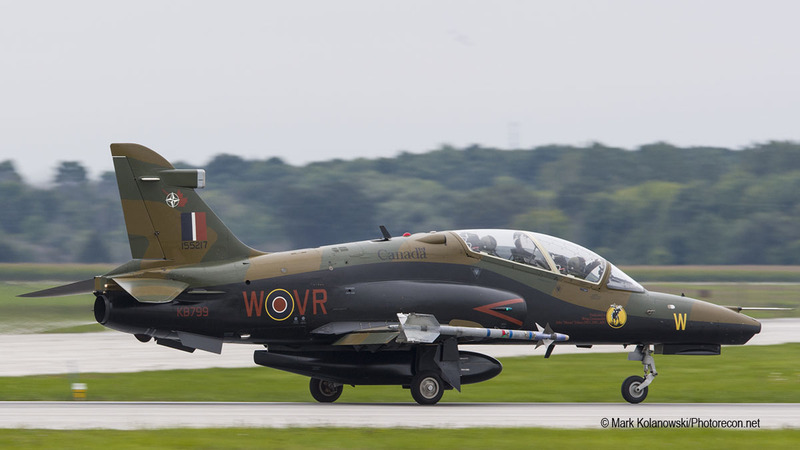 As of this writing the F-5 is still believed to be at London International over a week after the show. We wish Jeff a speedy recovery! 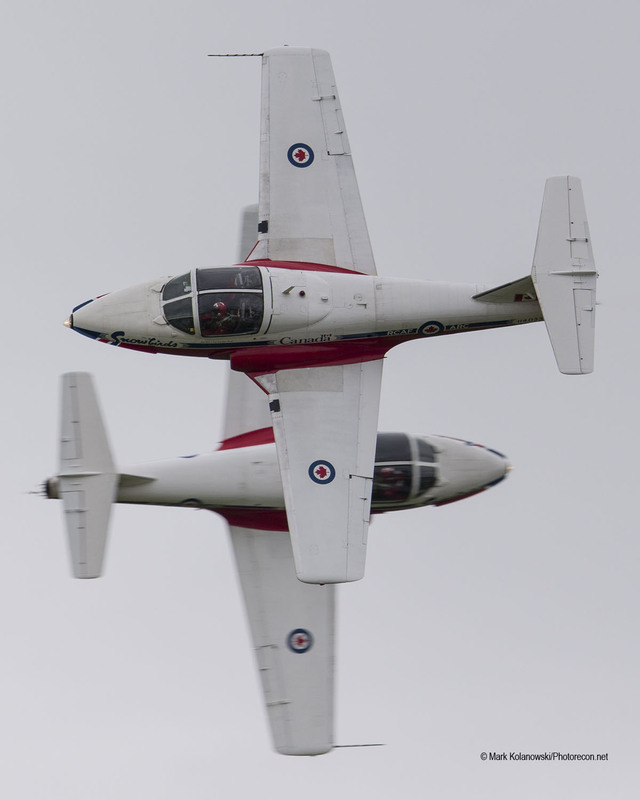 Sticking with the older jet theme, the Canadian Forces Snowbirds went up for their Friday practice run next. 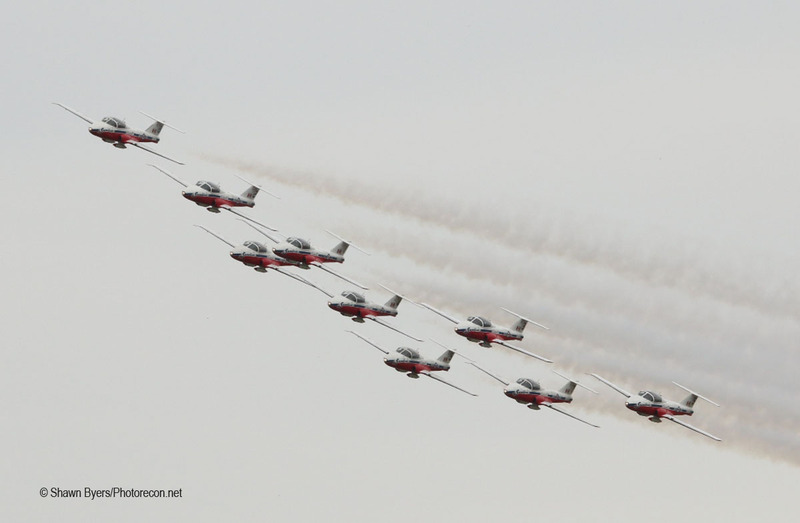 The Snowbirds are a common sight at airshows in the US and Canada, and are always a crowd favorite. Their mix of tight formations and heart stopping crossing maneuvers echo those of the Blue Angels and Thunderbirds, but with 9 jets there’s a lot more variety of formations and formation changes. 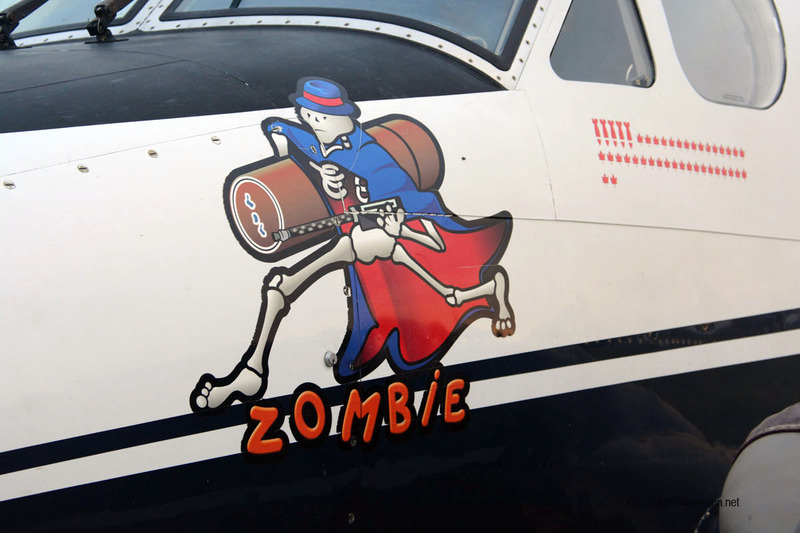 The lighthearted approach by their announcer is always appreciated, with quips about the weather and some jokes at the pilot’s expense being interwoven into the informative commentary, particularly later in the weekend with high temperatures in the 50s! Friday’s show provided an opportunity for the Snowbirds to share their mission with some of their friends from the States, as Viper Demo Pilot John “Rain” Waters as well as his safety pilot, and next year’s demo pilot Zoe “Sis” Kotnik all got to fly with the Snowbirds. It’s great to see the second seat of the CT-114s being utilized more that I recall in past seasons! Following the Snowbirds, a brief lull in the action allowed time for the media and photo pit photographers to take a rest as the public was admitted to the grounds for the conclusion of Friday’s flying. The “Hour of Power” is a Friday night tradition at Airshow London, and can best be described as part arrivals/pattern work and part twilight airshow. 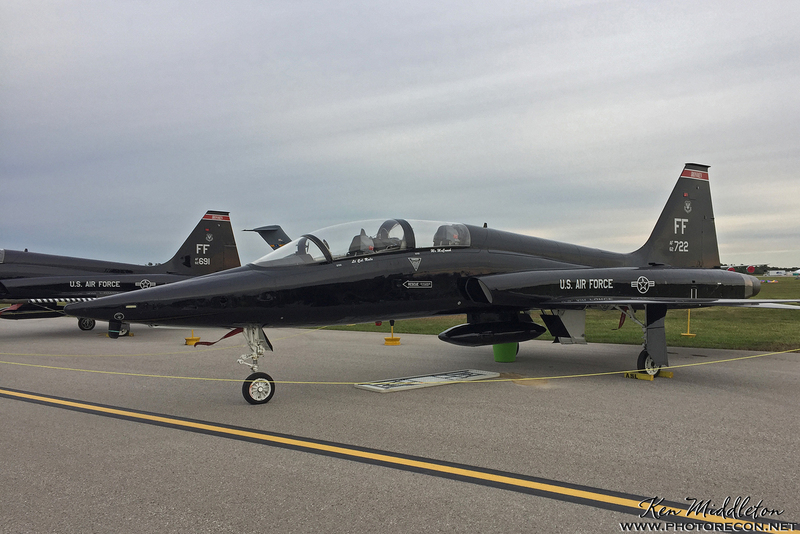 The 2018 edition featured arrivals by a pair of Tyndall-based F-22s, a P-8, F-15s from Seymour Johnson, and A-10s from Selfridge ANGB, just a short trip away in Michigan prior to the performances. 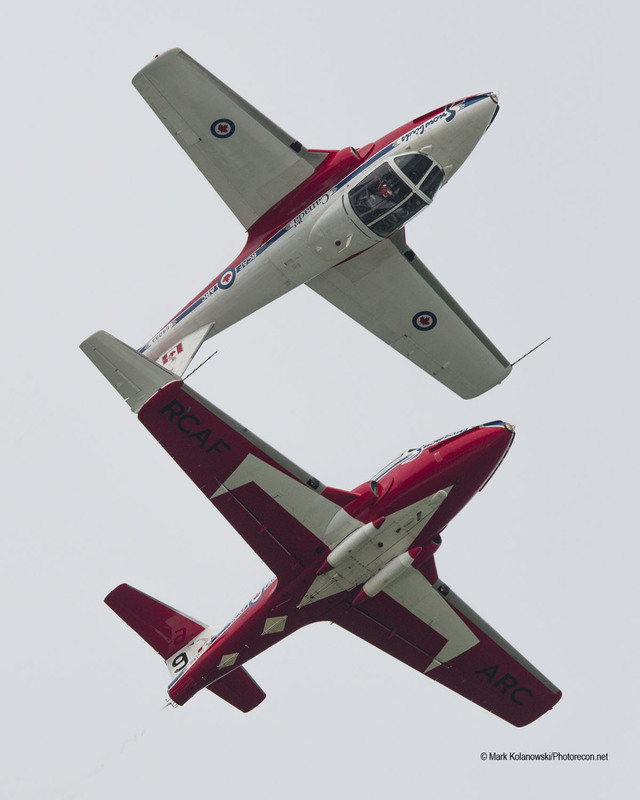 The Snowbirds put on an abbreviated demonstration in the waning light, with hints of golden sunshine occasionally breaking through the clouds to really light up the red and white Tutors. 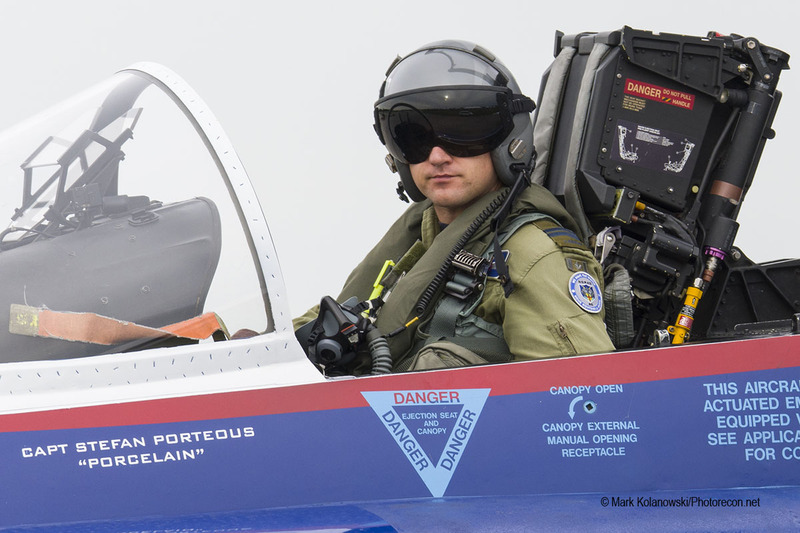 MAJ Waters took the F-16 up after the Snowbirds cleared the runway and flew his high energy demonstration for the second time of the day. While Rain’s demo is generally well flown, aggressive, and photographer friendly, the added visual of a cone of plasma shooting out the back of his General Electric F110 powered F-16 brought it to the next level! As is often the case at airshows, following the Viper Demo maneuvers, the F-16 joined up on the wing of a piece of Air Force history. 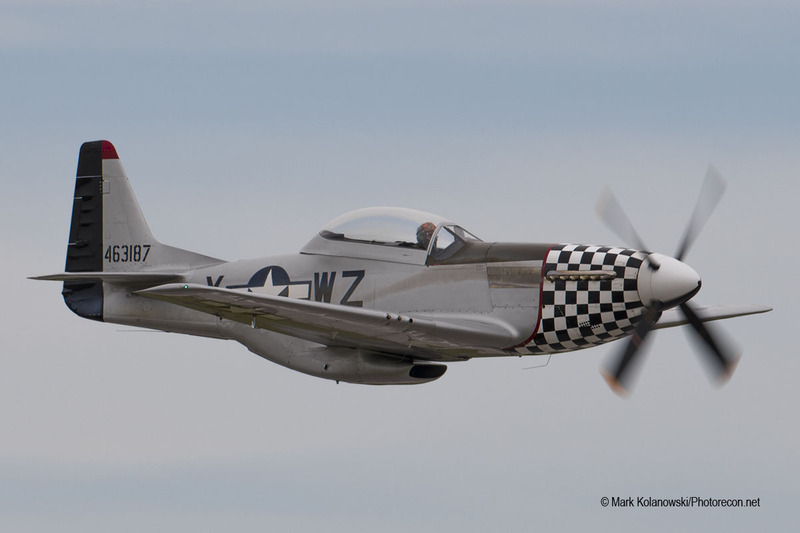 In London the Heritage Flight was led by Greg Anders in the TF-51D “Bum Steer”. Much like the F-16 Demo, the Heritage Flight had a bit of a unique vibe to it with the golden twilight skies behind decades of USAF history. 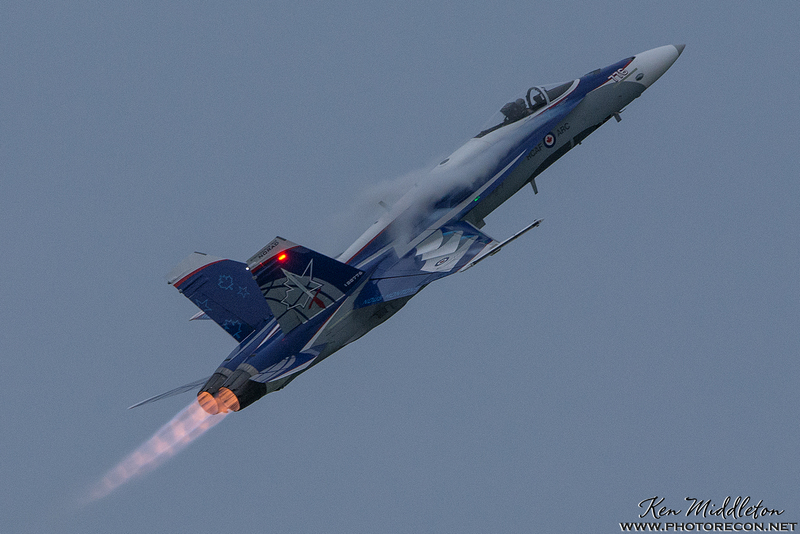 The Hour of Power was closed out nearly three hours after the gates opened to the public by Porcelain in the CF-18. Taking off just minutes before dusk, the CF-18 lit up the skies trailing twin cones of fire from the F404 engines as Captain Porteous strutted his stuff in the beautifully painted NORAD 60 jet. 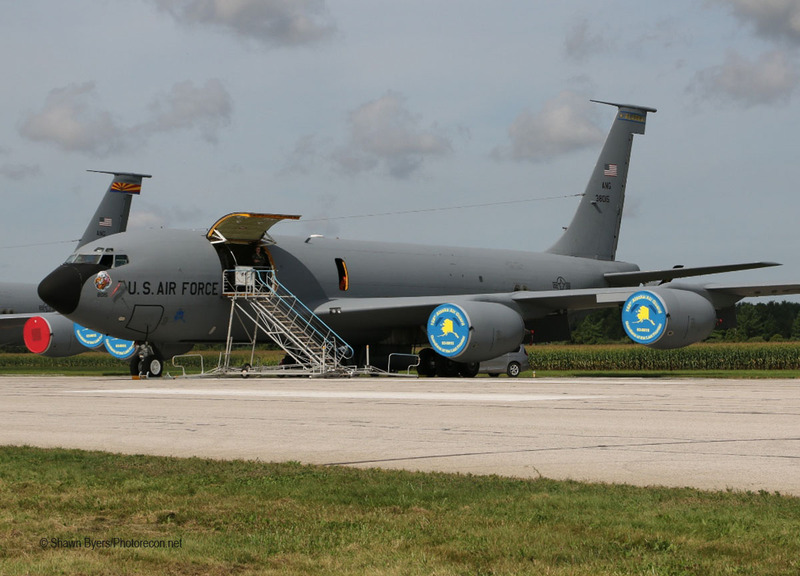 The aircraft livery features a blue and white ribbon motif on the top surfaces dedicated to the 60th anniversary of the partnership between the United States and Canada providing for the common air defense of North America and of course tracking Santa each and every Christmas Eve! 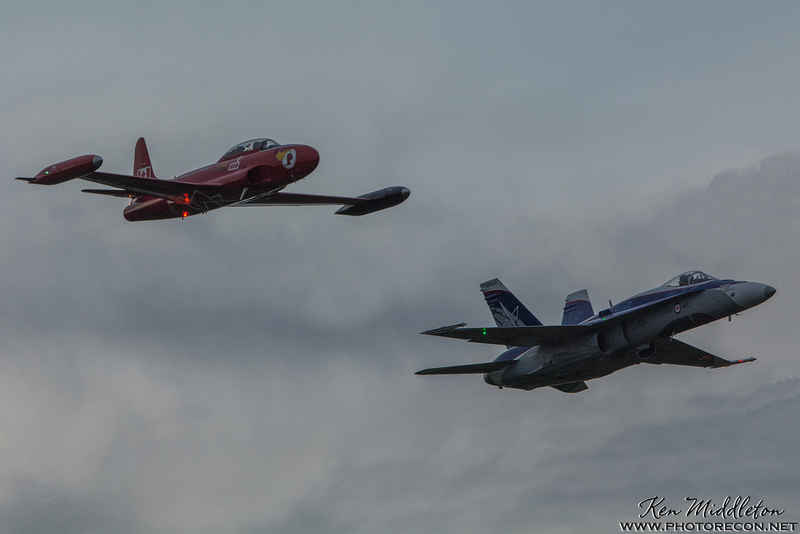 The flying portion of the CF-18’s demo concluded after joining up for a Canadian Heritage Flight, as the CF-18 joined the CT-133 Shooting Star “Red Knight” for a series of formation passes similar to the USAF Heritage Flight and USN Tailhook Legacy Flight programs. 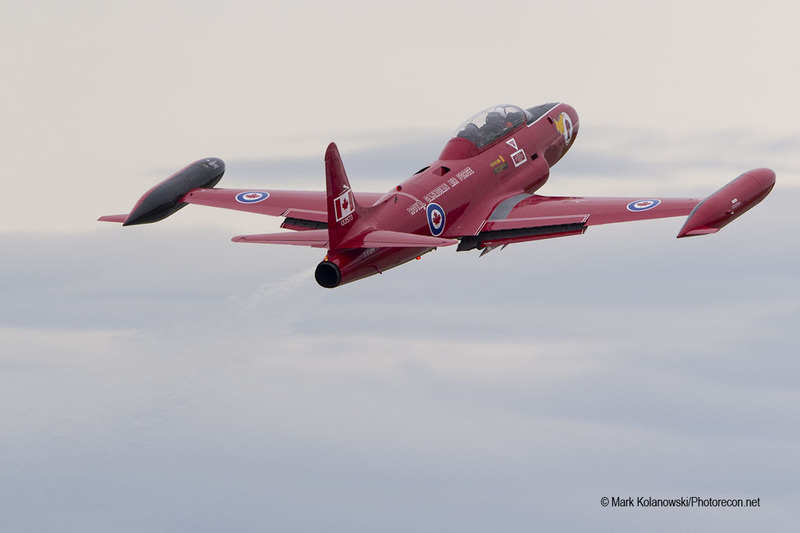 Following the pitch up break from both aircraft, and the safe landing of the London-Based red T-33, CAPT Porteous closed out the show in style, with a blue-hour landing on London’s Runway 15 with the tailhook down, creating a trail of sparks until snagging the arresting gear in place on the runway. 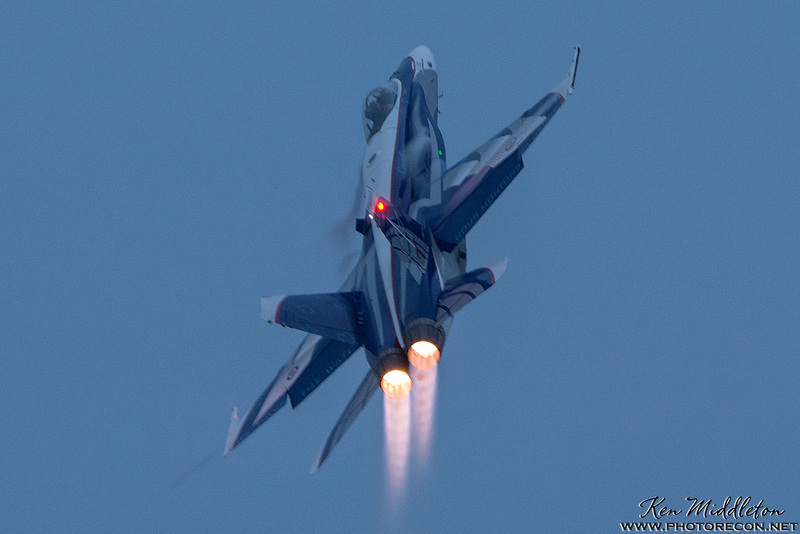 To say the Hour of Power was an excellent addition to an already solid show is an understatement, and all the aviation photographers can certainly agree that the opportunity to get some quality afterburner shots in low light is always a welcome occurrence. Saturday and Sunday’s shows more or less mirrored what was seen on Friday, but with increasingly stiff winds, thicker cloud cover, and lower temperatures as the weekend went on. 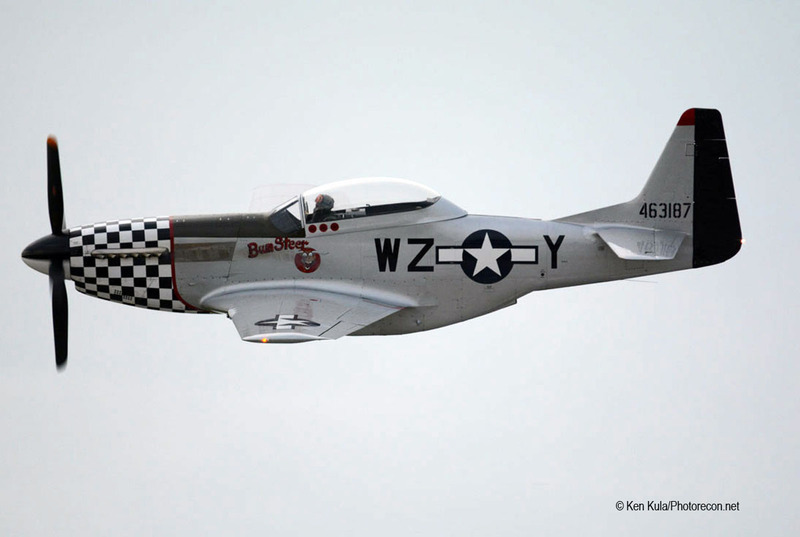 The winds were so high that the P-51 was grounded on Sunday and the paratroopers did not leave the jump plane. 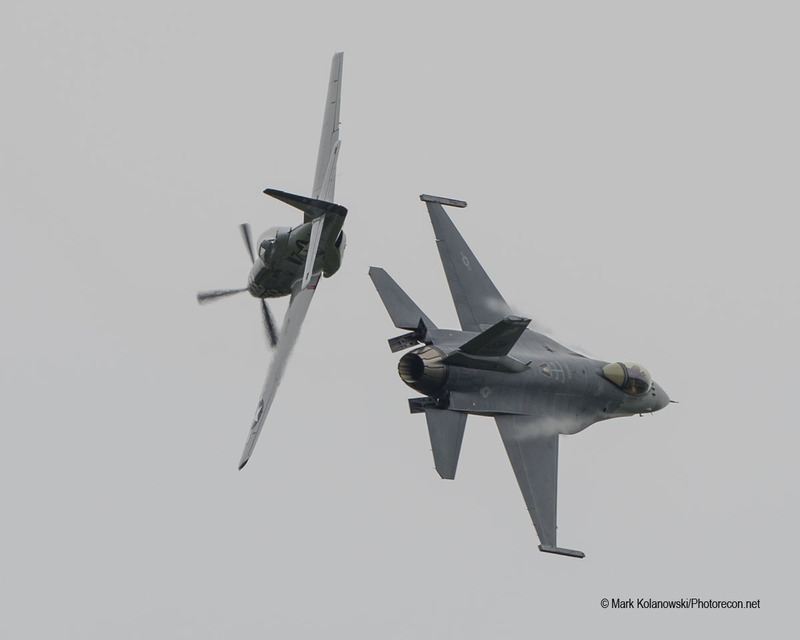 The flying portion of the show was kicked off both weekend days by some of the pattern work flying from operational units. 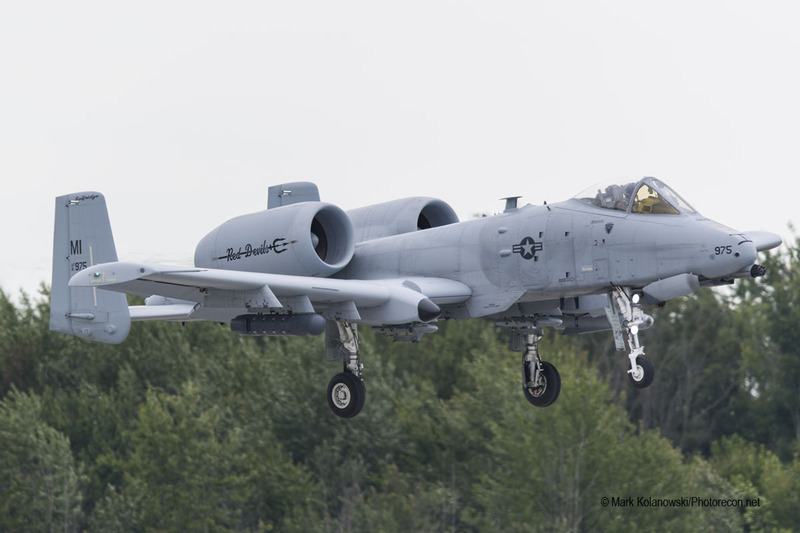 Saturday featured the Selfridge A-10s en-route to a flyover at Michigan Stadium, and Sunday featured the departure of the Hornets with a series of impressive afterburner takeoffs. 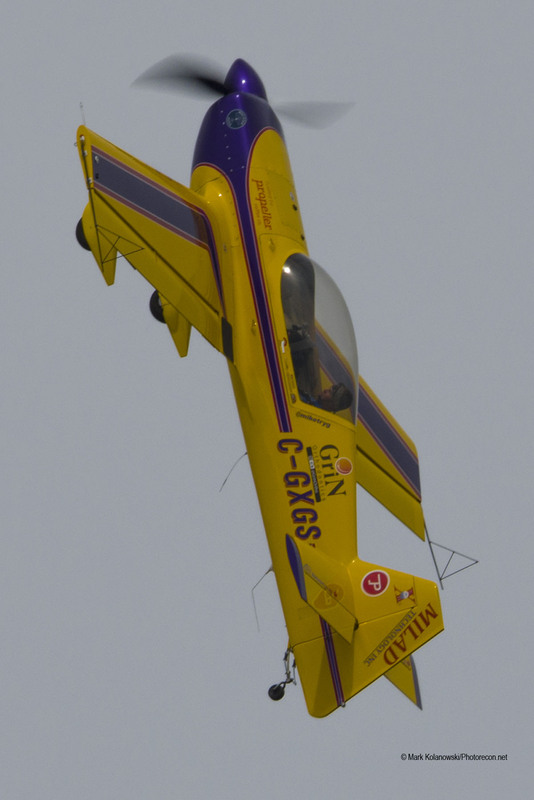 On the civilian side of the show Mike Tryggvason took the early performance slot in his yellow and purple Giles G202. The Giles differs from many other monowing aerobatic machines in that the leading edge of the wing is swept with a straight trailing edge. The aircraft is constructed of composites and seats two in tandem under a bubble canopy. While it has been eclipsed by the latest offerings from Extra and MX Aircraft, the Giles remains a potent unlimited category aerobatic bird. 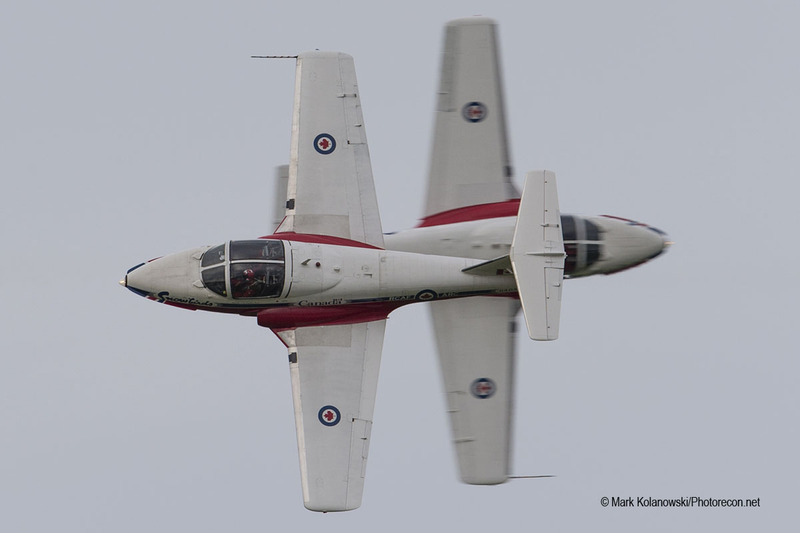 In the capable hands of Ontario’s own Mike Tryggvason, this particular G202 is put through a sequence of maneuvers similar to what one would expect to see in a high level aerobatic competition. While the maneuver doesn’t look impressive to the uninitiated, Mike’s performance of a flat 360 degree turn while aileron rolling the plane is an incredible display of stick and rudder skills and coordination. 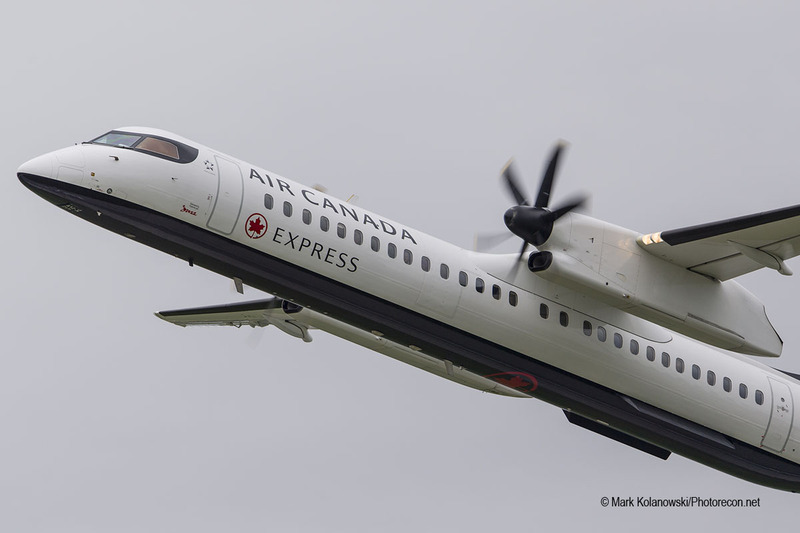 When he’s not moonlighting as an aerobatic pilot, Mike flies the Airbus A320 for Air Canada. 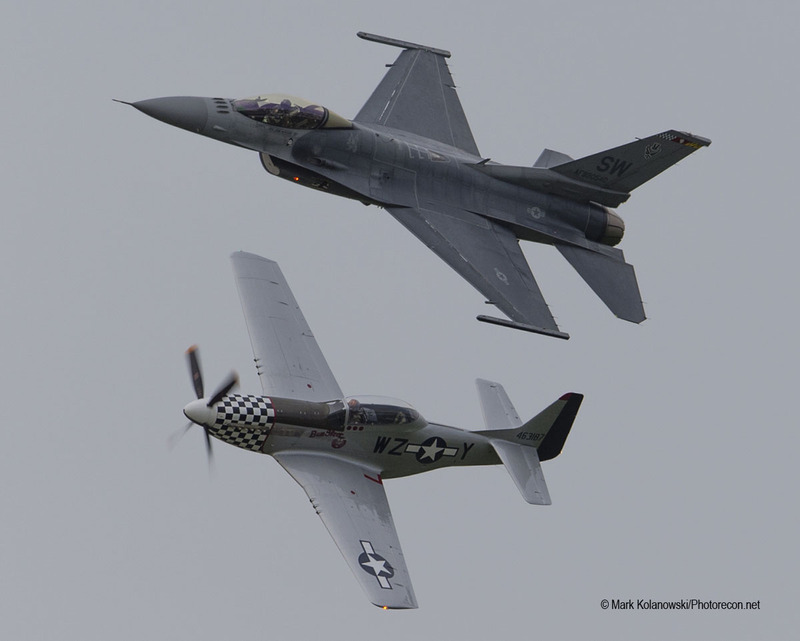 Following the Giles, the P-51 departed for a holding pattern while Rain took the Viper up. 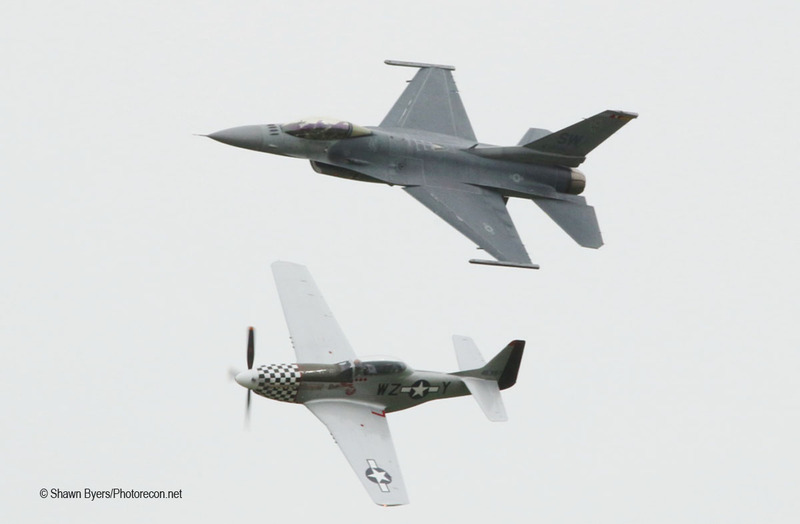 The F-16 rejoined with the Mustang for the Heritage flight on Saturday as planned and put on a show. The taller tail of the TF-51D was certainly a different look than the original airframe. I can’t say enough about how great it was to see the F-16 and CF-18 Demos at the same show, with two of the finest single ship performances in North America being able to strut their stuff for the London crowd. 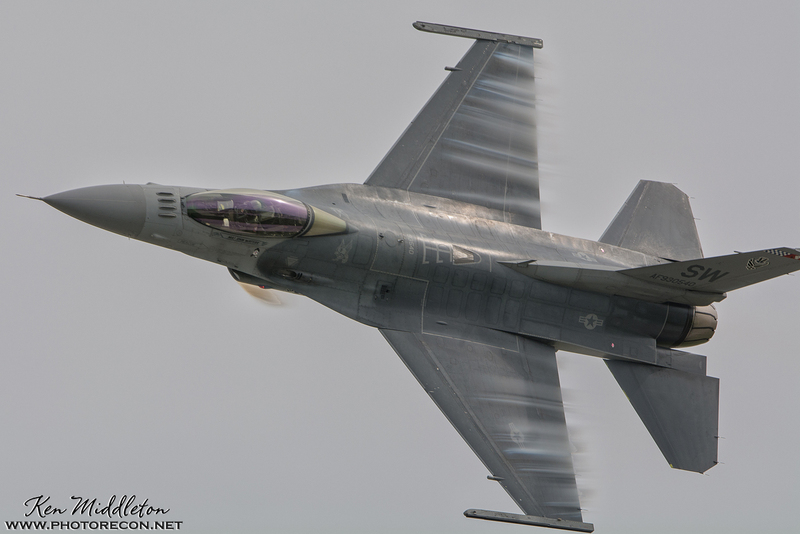 The noise and looks of the Hornet are a great compliment to the maneuverability and vapor brought to show center by MAJ Waters in the F-16 not to mention both jets flew a Heritage profile with a historical aircraft from a bygone era! 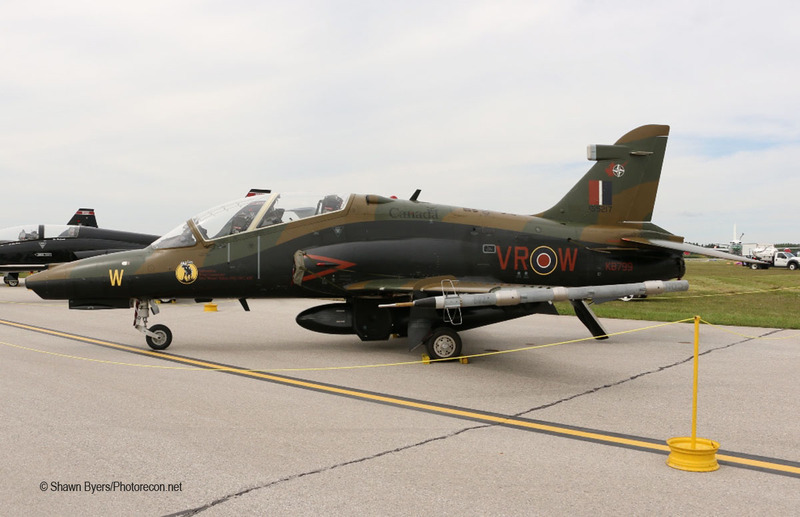 The author’s Garmin Virb Ultra 30 took a ride with Rain in the Viper on Saturday to capture a view of the demo that’s a bit more exclusive than most airshow coverage. 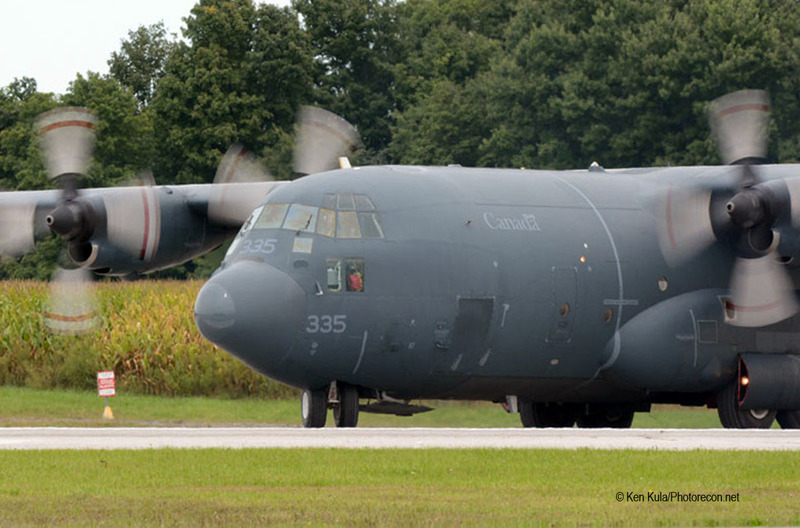 A Royal Canadian Air Force CC-130 was next on the performance slate, giving the assembled crowd a chance to catch a glimpse of the backbone of Canada’s airlift fleet. 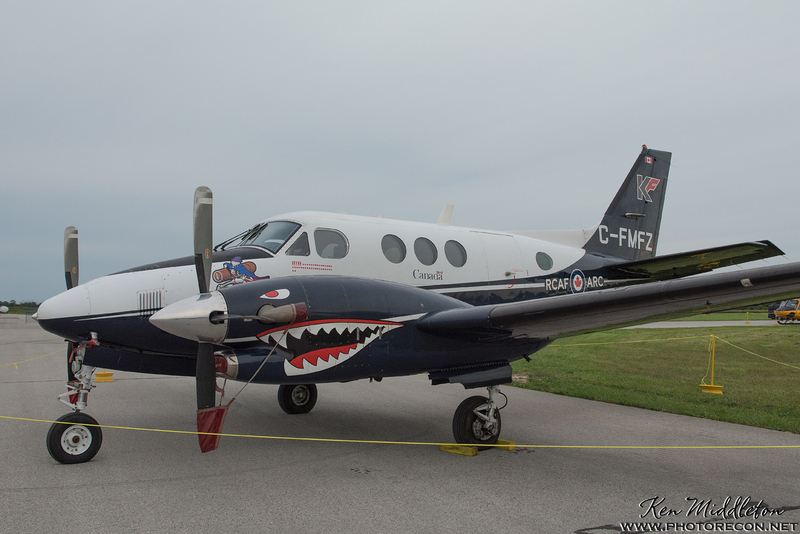 The Herk’s crew flew a series of passes including a high speed, high bank angle, and slow speed with the ramp open. 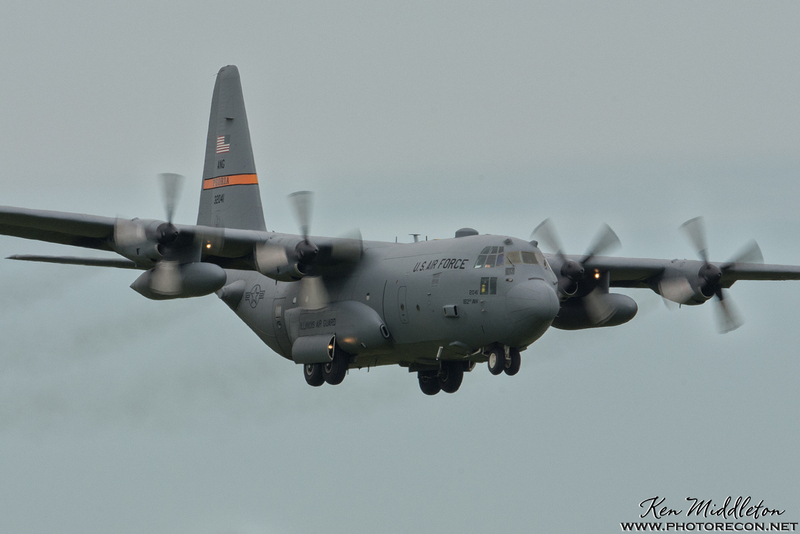 As the venerable airlifter passed show center on the slow speed pass it seemed there were boots hanging out the back, which was confirmed upon zooming in. Three of the aircrew made the most of the opportunity with the best seat in the house with the yawning opening in the back of the aircraft in full flight gear, including HGU-56 helmets! 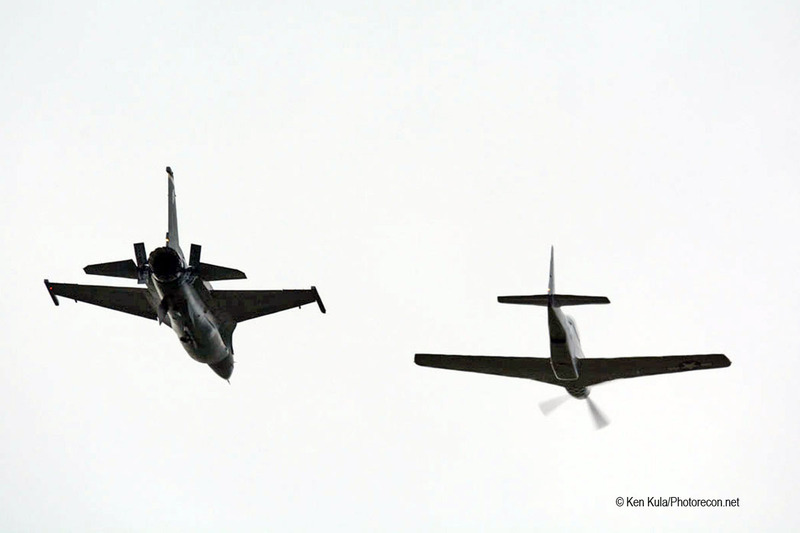 The graceful jet aerobatics of Paul Keepler’s F-86 followed the Hercules. 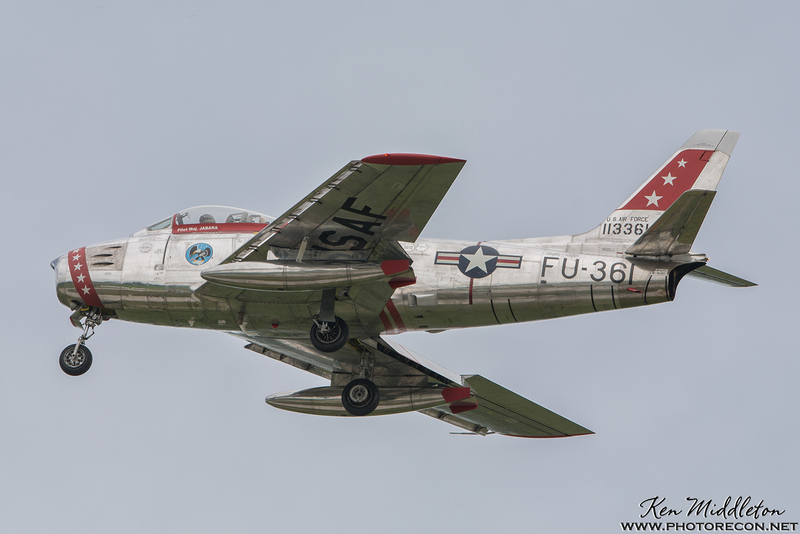 Despite the clouds, the F-86 was shining bright in the skies over London as Paul showed the audience just what a 60+ year old jet can do in skilled hands and with proper energy managment. 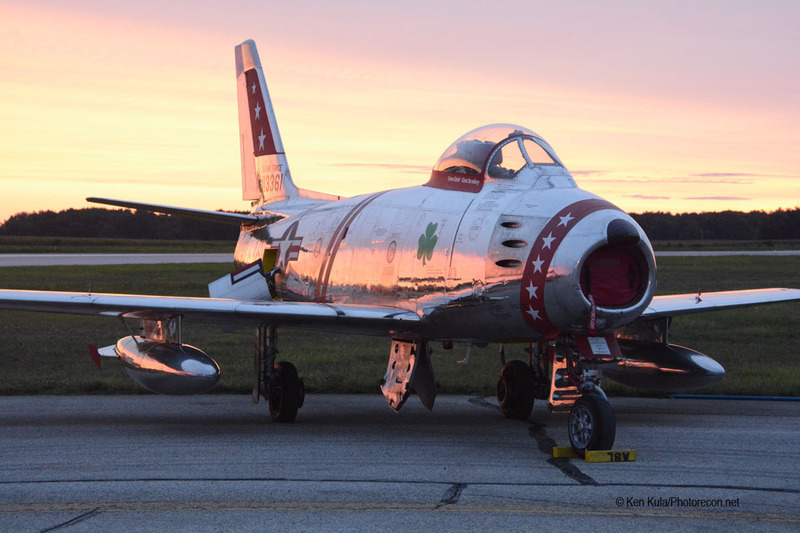 This particular F-86, N50CJ, was built in Canada as a Mk6 Sabre and served in the South African Air Force prior to becoming a target tug and later a privately owned warbird. 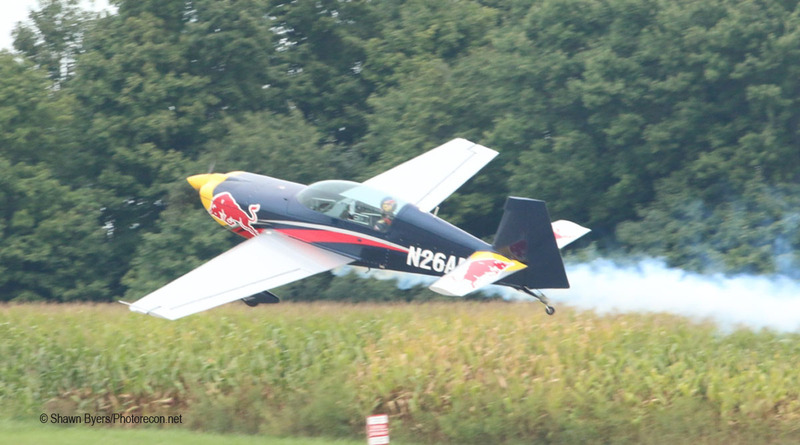 Later in the show, hometown Red Bull Air Race star Pete McLeod took to the skies. After years of performing airshows in an Edge 540, Pete now flies the Extra 330LX. His new aircraft, N26AM, was the #2 Red Bull Air Race Challenger Class aircraft the past two seasons and still retains much of that livery. In stark contrast with the grace of the Sabre, Pete’s flights in the Extra were an outstanding display of precise unlimited aerobatic flying as the blue and silver monoplane violently tumbled and rolled through the show box. It’s always a treat for a performer to strut their stuff at their home show, particularly when they’re playing with a brand new toy! 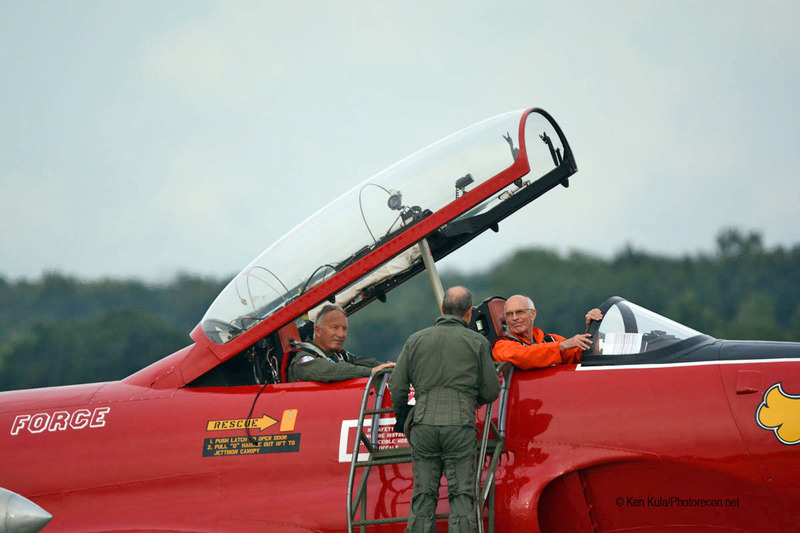 Despite stiff, on-crowd crosswinds, both Pete and Mike’s routines stayed right on the prescribed showline with the expert aviators compensating perfectly for the trying conditions on Saturday and Sunday. More hometown heros took off next, with the Snowbirds heading up for their demonstration. Wowing the crowd with their massive array of signature formations and opposing passes, the Snowbirds fought the gusty conditions to put on an outstanding demo. 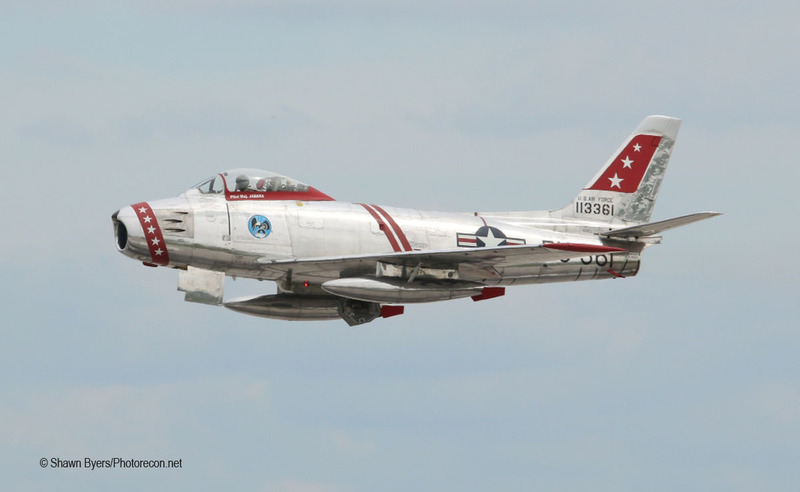 The Tutors were getting bounced around so bad during Sunday’s demo that a few maneuvers were simplified or removed, and CAPT Greg Hume-Powell, Snowbird 8, expressed after the flight that he wished he had a mouthguard in to minimize the effect of the turbulence on his jaw! It’s not every day you hear a jet team solo longing to wear a piece of hockey equipment in their jet, but then again it’s not every day that airshows are visited by gusts in excess of 30 knots! 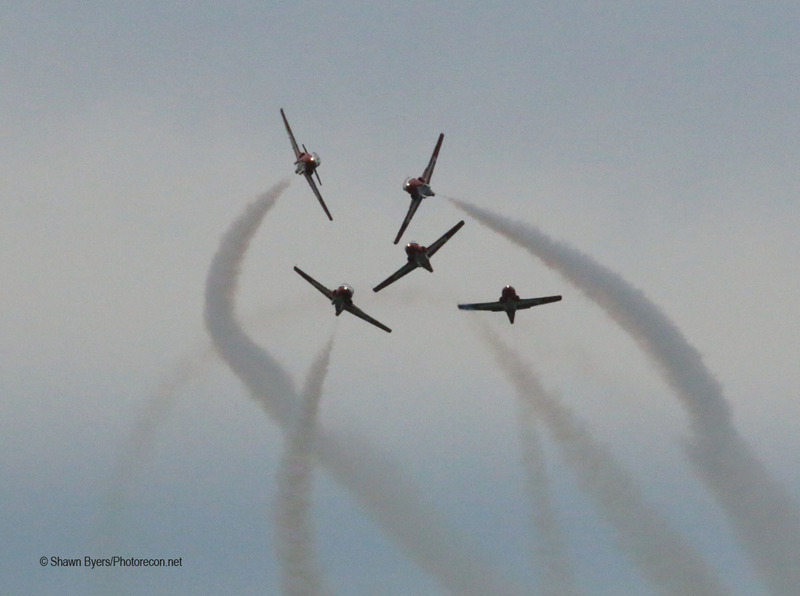 Saturday’s Snowbirds demo was followed by a series of jumps by the SOCOM Paracommandos and Canadian Forces Skyhawks. 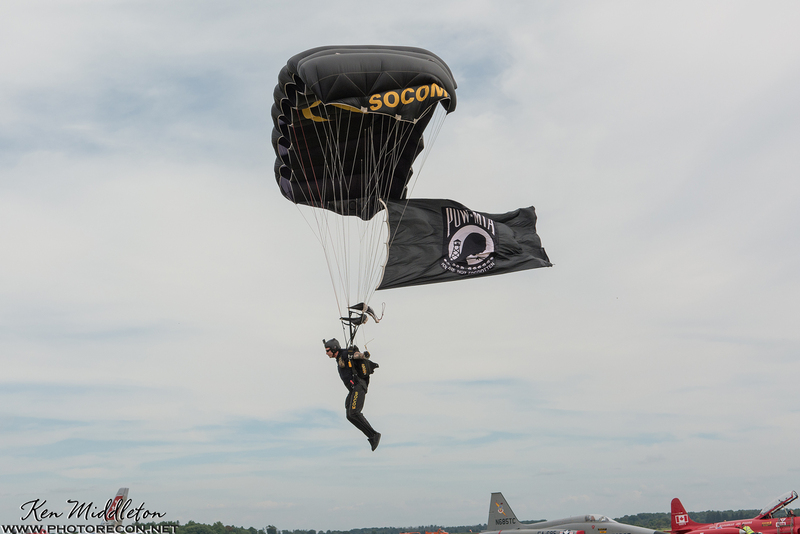 Saturday’s jump represented the first time the Paracommandos jumped with an international team in an airshow. 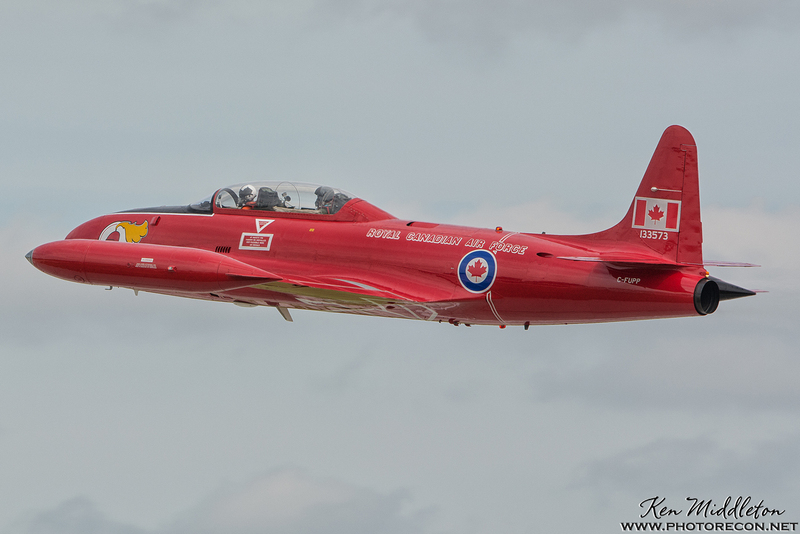 The transition from vintage jet to skydivers and back to a classic jet (a solo demo by the Red Knight) was seamless, owing to the scheduling prowess of the London Airshow team. 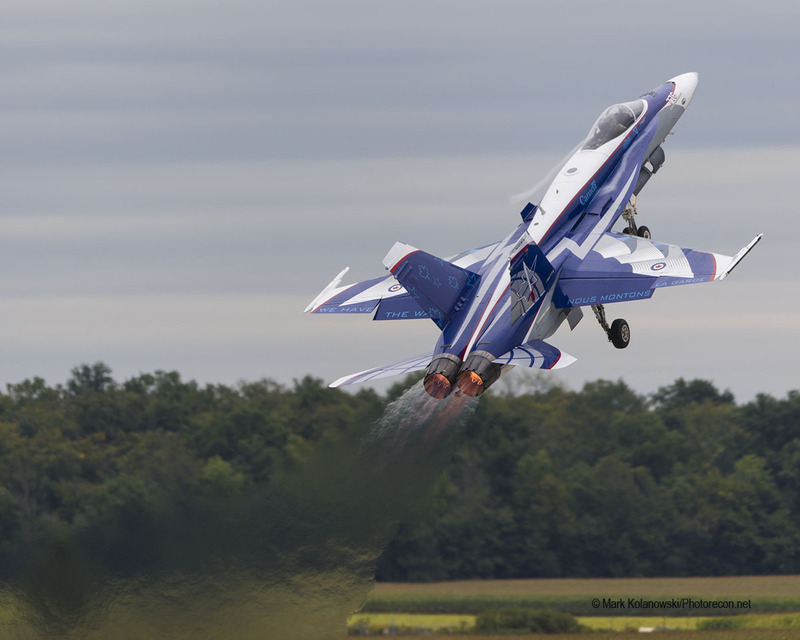 The show had been meant to close with Porcelain’s CF-18 demo, and indeed he flew in the final moments of the waivered airspace for the show. 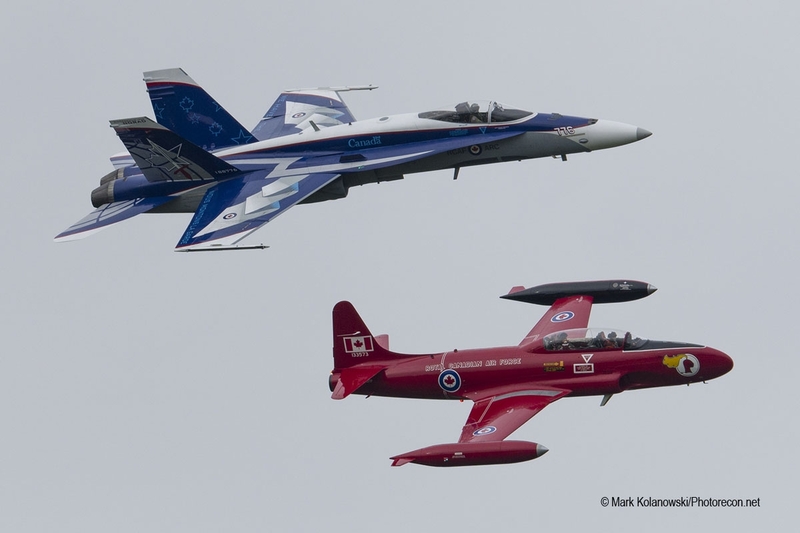 It was fitting for one of the biggest airshows in Canada to be finished by one of the most iconic elements of Canadian aviation in the specially painted demo CF-18 along with the heritage flight where the Red Knight joined up with the NORAD 60 Hornet. 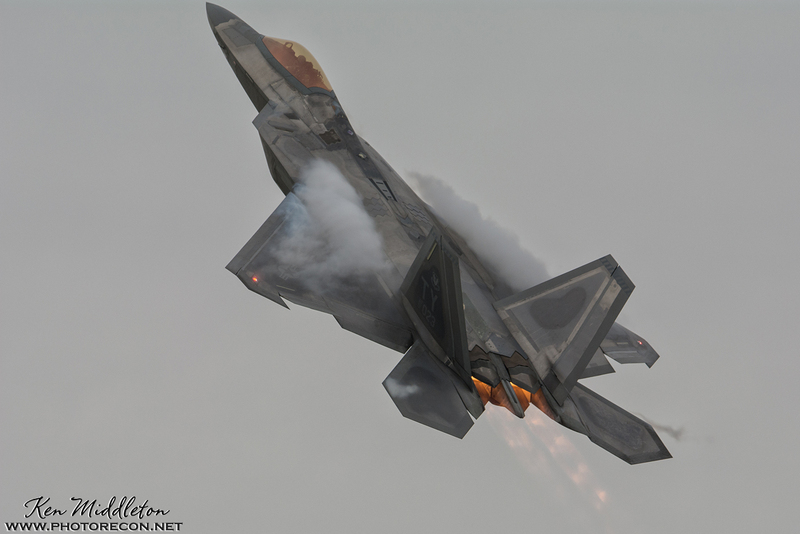 Saturday’s show was extended for just a few minutes for a few high speed passes, low approaches, and an unrestricted climb from one of the F-22s to close out the day’s flying program. A little-known highlight of the show was the flight time granted to “Katie’s Bears”, an Airshow London T-Shirt clad teddy bear that took to the skies with the performers both military and civilian. 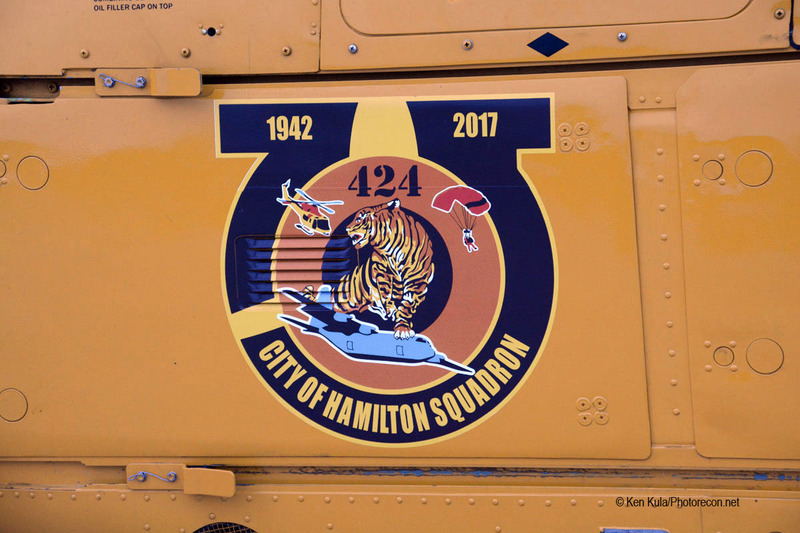 The bear was named in memory of Kaitlin Vanderhoek, the late daughter of the Airshow London Director of Flight Operations Gerry Vanderhoek. Kaitlin was an aviation and airshow fan. In addition to 350 bears being distributed to children attending the airshow in a special VIP area, 30 of the bears took to the skies with performers and will be spending considerable time aloft as they travel from show to show gaining flight time and fame in hopes of inspiring children fighting medical issues that the sky is not the limit! You can follow their journey at https://airshowlondon.com/katiesbear/! 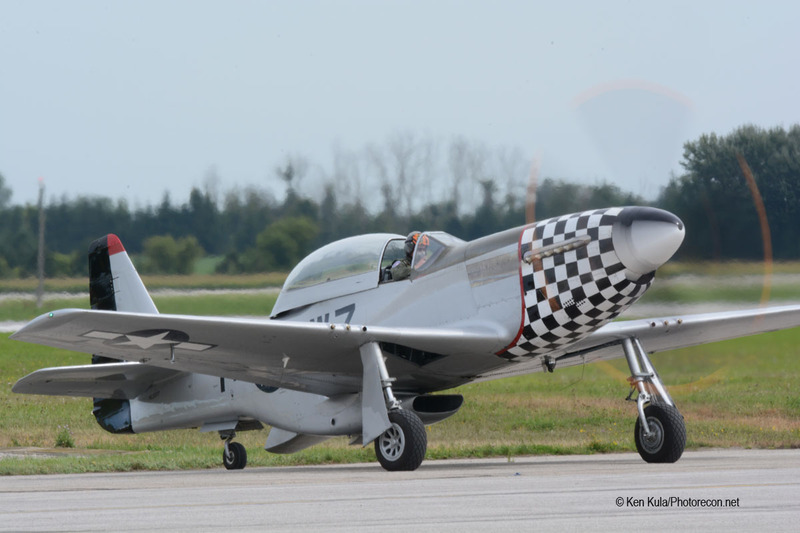 The author would like to thank the entire CivilAviationWorld/ClassicWarbirds/PhotoRecon team for a warm welcome as well as the show organizers for putting on an amazing event. 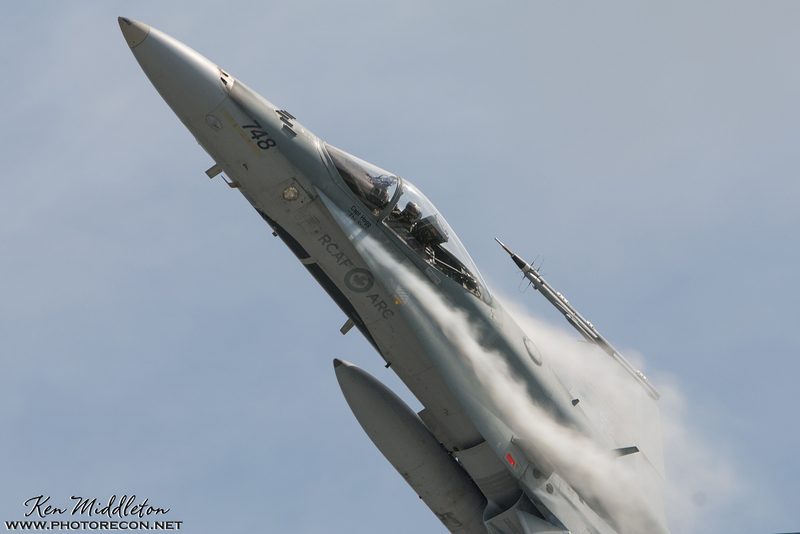 Additional appreciation is owed to the Viper Demo Team for taking a video camera along for a ride and to Nikon Canada for providing top of the line loner gear that helped make some of the attached photographs possible! The Photo Gallery is filled with the Photorecon.net/ClassicWarbirds.net/CivilAviationWorld photo team’s photos… from Shawn Byers, Ken Middleton, Mark Kolanowski and Ken Kula.